“The Cathedral, Chichester, Sussex, England - Raising of Lazarus,” Gothic Past, accessed April 18, 2019, http://gothicpast.com/items/show/3951. 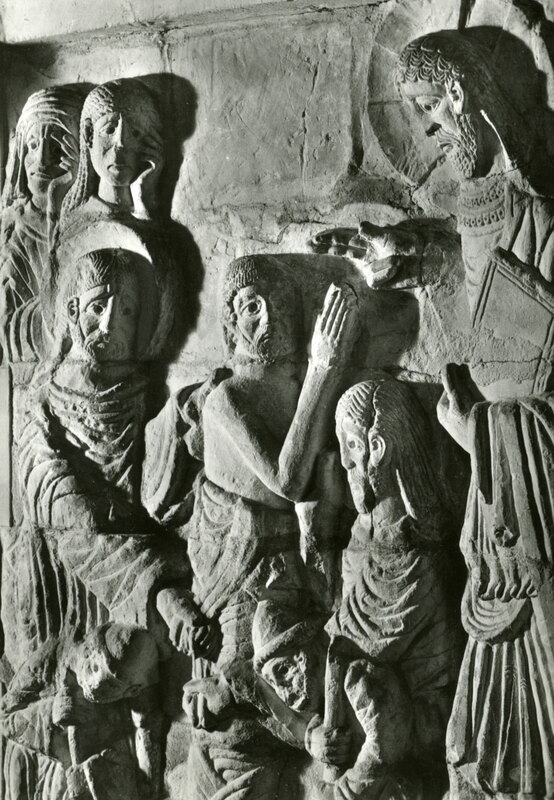 Among the most precious possessions of Chichester are two carved stone panels in the south aisle of the choir, this one depicting the Raising of Lazarus and another showing the arrival of Christ at Bethany. Authorities differ as to whether they are Anglo-Saxon work of c.1000 or Norman of c.1130. They are among the finest existing works from this period in England. The work of English sculptors has been greatly influenced by them, notably that of Eric Gill who spent a few years in Chichester from the age of 15-17.